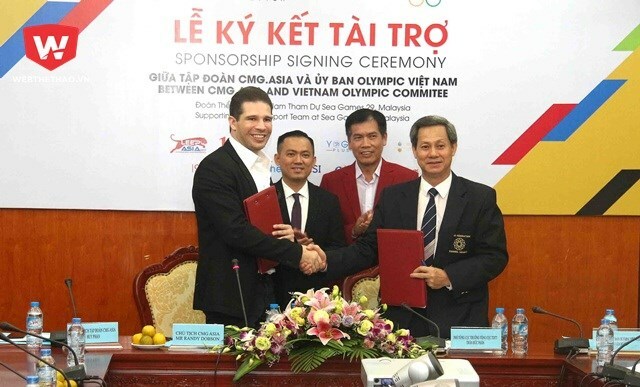 Hanoi (VNA) - CMG.ASIA Group on August 4 signed a total sponsorship contract worth 1 billion VND to support the Vietnam sports in general and the Vietnam sport delegation participating in the 29th Southeast Asian (SEA) Games in Malaysia. Attending the signing ceremony were Tran Duc Phan, Deputy General Director of the Vietnam Sport Administration, Chef-de-mission of the Vietnam sport delegation; Van Manh, General Serectary of the Vietnam Olympic Committee; Randy Dobson, President of CMG.Asia (California Fitness & Yoga Centres); and leaders, officials and athletes competing in the SEA Games. Following the agreement with the Vietnam Olympic Committee, CMG.Asia will provide 1 billion VND for national athletes who will compete at the 29th SEA Games in Kuala Lumpur, Malaysia from August 19 to 30. Apart from 500 million VND in cash, the donor will provide facilities as well as health care and nutrition services for athletes at all studios of CMG.ASIAnationwide. Speaking at the ceremony, Randy Dobson said: "As part of our corporate social responsibility and our mission to help inspire the people of Vietnam to make life better through fitness, CMG.ASIA is honoured to continue working with the Vietnam Olympic Committee to sponsor the Vietnam sports delegation at SEA Games 2017".